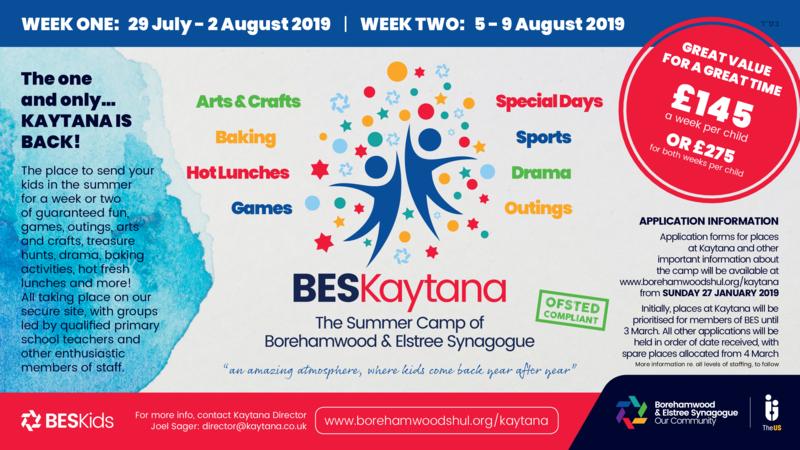 With thousands of children and youth gracing our ever-expanding community, Borehamwood and Elstree Synagogue (BES) aims to provide activities for all, both of a religious and non-religious kind. We are keen to ensure the safety of all children spending time at BES, and have implemented a policy to deal with this. Age 0-2 (Babies and Toddlers). Next services 30 March, 13 April 2019 at Croxdale Road. During the autumn and winter months, there's Gingerbread Storytime at Croxdale Road and Yavneh on Friday nights for all children up to and including Year 6. During the autumn and winter months, we run BASE, an interactive parents and children learning programme, starting at hour after Shabbat, with weekly prizes available. PURIM: Megillah dramas, shows, carnivals and more. SHAVUOT: Special learning programs and ice-cream parties. ROSH HASHANAH: Special services and the famous BES "Tashlich in the Park" for all families and treats for the kids. YOM KIPPUR: Special lunches and afternoon programs. SUCCOT: The famous "Succah Crawls" and the awesome Simchat Beit HaShoeva! SIMCHAT TORAH: A special dinner for all the children, including additional entertainment and excitement. CHANUKAH: parties, entertainers, fireworks and more. Each week, there are many activities hosted on the BES premises, including JLGB, Rainbows, Brownies, Girl Guides, Beavers, Cubs and Scouts. Every summer, BES runs a Kaytana (children's summer camp) for children aged 5-10.